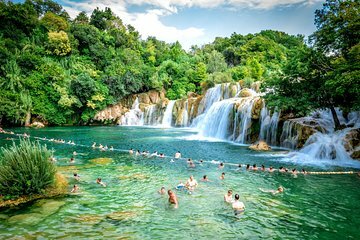 Scopri le spettacolari cascate del Parco Nazionale Krka in un modo che fa per te, con un viaggio che offre l'opzione di esplorazione privata o tour guidato. Viaggia comodamente fino alla posizione periferica tramite un autobus con aria condizionata e scopri le attrazioni del parco senza i limiti di un itinerario di gruppo. Trascorri il tuo tempo libero nuotando nello Skradinski buk o scegli di scoprire la storia del parco in un tour a piedi, con approfondimenti forniti da una guida. They oversell tickets so it’s crowded and bring you on a worse bus. No WiFi as promised. Warm water given AFTER the waterfalls. Not much of a skip the line because you still have to wait for them to get the tickets then wait in the queue for the boat which takes ages. One of the best National Parks I visited in Europe. Bus was really comfortable,and atmosphere was amazing. Our guides where really well organized and it seemed that we spent more than just one day at this beautifull location. They provided all informations that we asked. I highly recommend this tour to everyone,you will not regret. Perfect day!! Amazing National Park with the best guidence. I really enjoyed spending a day at this location.Really proffesional and knowledgeble staff but also very friendly,well organized trip and great transport Bus. It is great price for service that I got and definitely recommending this tour. Krka national park which includes famous Krka waterfalls is perfect escape to the nature. This one day trip is enugh to see and explore everything Krka offers. Short trip from Split and you're there. Staff provided all the information, water and tips and tricks. It turned out to be really useful that we had a fast pass and didn't have to wait in the long queue. Take this trip and take a break from city madness! You'll love it ! Krka waterfalls trip was just the right thing we needed! Excellent organization, professional staff and proper fun! If you fancy a swim, go for it! Fresh water was provided, and there’s no waiting in line. Highly recommend!